The morning of August 16 dawns bright and early. We are all awake by 6:30 and the community is already moving; women are drawing water from the borehole near the CBCC (preschool), which was built by Joshua Orphan and Community Care, where we are staying. Today is our first full day in Solomoni, the community where we will supervise the drilling of a borehole for the primary and secondary schools. By 7:45, we are heading to the borehole site to begin our surveying of the area. 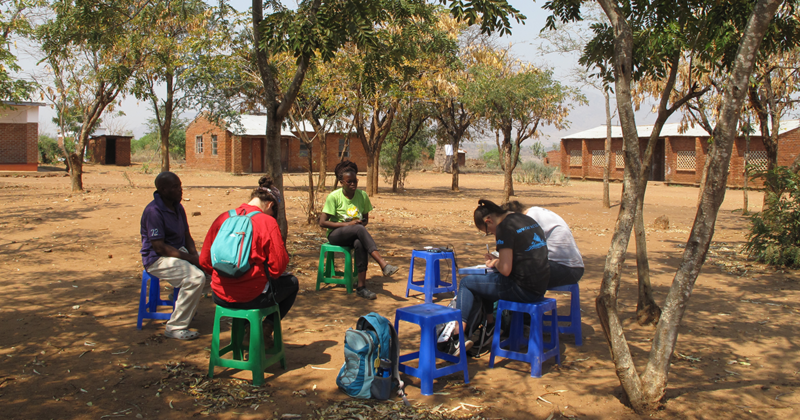 Other than the actual drilling of the well, surveying is the main goal of this Engineers Without Borders (EWB) trip to Malawi. We begin in the grove of trees near the secondary school where the well will be located. The primary school is across the football field, a large empty, flat dirt rectangle with two metal goals on either end. Both the primary and secondary schools are made of brick and made up of multiple, two room buildings with an open brick patterning on the walls to let in light. There is no electricity in Solomoni other than the two solar panels on the library, so natural light is key. We begin our survey by measuring across the large field and into the clustered buildings of the primary school. It is here where we first see the remnants of a prior international development project designed to bring water to these schools. That system was wind-powered and broke years ago after the NGO was dissolved, and there was no-one to repair the system, so the water distribution stations slowly fell into disrepair. It is a sobering reminder of the importance of our work. It is not enough to drill another borehole, call it a day, and return to the States. There is a responsibility to teach the members of the community how to fix whatever may break. It is also a reminder that we are not here to tell the community what it needs. As we listen to the headteachers discuss the old system and the water access locations they would like to see in our new system, it is clear they know the design they want: Solar panels to power the pump rather than wind and three different distribution points in the primary school. These points are added to our survey. Everyone invested in this project has their own expertise, the teachers know the school and the needs that must be met, Joseph – the head of Joshua – knows how to run the NGO that is deeply involved in the community and the schools, Chris – who drove us here and around Blantyre – seems to know everyone and where to find everything we need. We are learning from them just as they are learning from us. It is too easy to fall into the trap of international development being about telling people what they need, when in fact most people know what they need, but may need different skill sets to achieve it. International development is never a one-way flow of information and resources. We learned from the people of Solomoni as they learned from us. Furthermore, it takes a wealth of resources to perform the types of projects we are working on. Without the in-depth knowledge of Joseph and the rest of the staff at Joshua, we would not have been able to find nearly half the resources we used this trip. Without the water board members, the rain gauge and water flow patterns in the community would have been a mystery. Zikomo kwambiri to everyone who aided us on this trip.